Part Number: 3 x QUANTUM-1000. 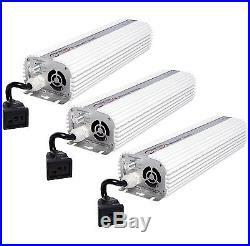 (3) Brand New Quantum 1000 Watt Dimmable Electronic Ballasts. Run at 100%, 75% or 50% power. Strike both Metal Halide and High Pressure Sodium Bulbs. Accepts 120v or 240v with no wiring needed (Both cords included). Accepts 50 Hertz to 60 Hertz with no extra wiring needed. (3) Quantum 1000W HPS & MH Dimmable Ballasts. The world of indoor gardening was changed forever with the introduction of the Quantum 1000 Watt 120/240V Ballast. It's a great alternative to heavy, noisy, power-wasting core and coil ballasts. Quantum Series Lighting is the only ballast that is fully compliant with Part 18 of FCC rules and regulations. The Quantum 1000 Watt Dimmable Electronic Ballast device has gone through rigorous testing in lab facilities that replicate the most extreme atmospheric conditions. This ballast can withstand the high heat and humidity that any garden can throw at it. It can be run at 100%, 75% or 50% power, and it can strike both metal halide and high-pressure Sodium bulbs. Accepts 120v or 240v (Both cords included). Has a Power Factor of 99.9%. We are an authorized Hydrofarm dealer. Runs 15% cooler than other digital ballasts on the market. Has a continuous Power Factor of 99%. The most stable output frequency of any ballast. Higher lumen output than magnetic ballasts. Light weight and care free. Comes complete with a sealed fan for efficient cooling of the circuit board. Can efficiently be run on generators without flickering. Resin sealed circuit board for high humidity installations. Can easily be used in conjunction with lighting controllers and flip boxes. To provide you with the equipment at reasonable and fair prices. Over 45 years of combined experience from the top levels of Quantum Horticulture ensure that your needs as a gardener are met in every way. We have been in every predicament possible... From gear that breaks down at the worst time possible to spending hundreds of dollars on products that just do not do what they claim. Don't let out of touch, market driven companies tell you what's best for your garden. Trust the pro's at Quantum Horticulture to help you drive your garden to levels previously thought unattainable. Cancelling Your Order: &###xA0;Your order is important to us and will be processed immediately. Select the reason for the return. This listing is currently undergoing maintenance, we apologise for any inconvenience caused. 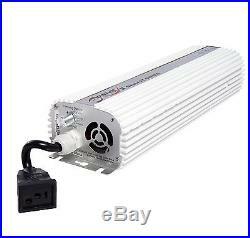 The item "(3) QUANTUM 1000W Watt HPS & MH Dimmable Digital Grow Light Ballasts QT1000" is in sale since Wednesday, November 20, 2013. This item is in the category "Home & Garden\Yard, Garden & Outdoor Living\Gardening Supplies\Hydroponics & Seed Starting\Grow Light Ballasts".